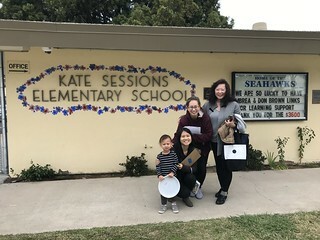 CISDSU Student & Parent Received National People-to-People Award in Washington D.C.
On November 30, 2018, Confucius Institute at San Diego State University (CISDSU) launches the Six Arts Program at Kate Sessions Elementary School. The program aims to teach the students the Six Arts subjects, including Tea Ceremony, Chinese music, Mahjong, Calligraphy, Painting, Chinese Chess, Magic Puzzle, Taichi, Martial Arts etc. The program will start from January to March, 2019, a total of 10 weeks. On December 5, CISDSU Six Arts Program team met with the Education Enrichment Team at Kate Sessons along with a school visit. Parent leaders and student ambassadors warmly welcomed the delegation from CISDSU and gave them a tour of the school. After the school both teams discussed further plans for the program. We look forward to bringing fun and exciting cultural experience to the students though the Six Arts. 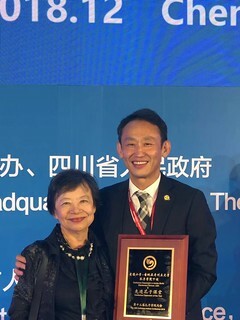 In December 2018, the CISDSU Confucius Classroom School: Adobe Bluffs Elementary School was awarded the “Confucius Classroom of the Year” at the 13th annual Confucius Institute Global Conference. The Conference took place at Chegndu, China this year. Congratulations to ABES! On December 4, 2018, Confucius Classroom student Kamila Carter delivered a speech at the Confucius Institute Global Conference. 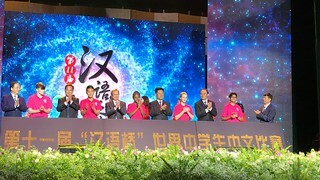 The conference took place in Chengdu, China this year. Kamila Carter who is the child of deaf parents, studies at TDS Middle School in Lakeside, one of the Confucius Classroom schools provided by the Confucius Institute at San Diego State University (CISDSU). She spent her elementary school years at Riverview International Academy, also one of the CC schools. Here students are provided a Chinese Immersion Program in order to grow their Chinese speaking abilities. Her multilingual talent shines in life and on stage – she speaks five languages: Chinese, English, Spanish, American Sign Language, and Mexican Sign Language. Kamila received the National People-to-People Award from the Confucius Institute at the U.S. Center in Washington D.C. in September and was selected as the student representative for the CI Global Conference this year. Congratulations to Kamy! From November 29th to 30th, 2018, CISDSU hosted a field trip for the 3rd grade students from Barnard Elementary School. The field trip featured two main activities: A Taste of Six Arts and Chinese Tofu Making. During the taste of the Six Arts, the students learned about the Chinese culture in a fun and exciting way. At each “Art Station” the students experienced different aspects of the arts, for example, a traditional Chinese tea ceremony, Guzhen, Taichi, magic puzzle, calligraphy, and an abacus. During the second part of the culturally rich experience, students made two traditional Chinese cold dishes: Scrambled Tofu and Dried Tofu String Salad. Afterwards, the students drew their tofu recipes based on what they learned. The Six Arts field trip not only provided opportunities for the students to learn about the Six Arts and practice their language skills, but they also had the opportunity to experience Chinese culture and Chinese food making for the first time. Many teachers and parents who came with the students expressed that they enjoyed the field trip as well as the students and were happy to see their children learning and experiencing a new culture in a fun and educational environment. 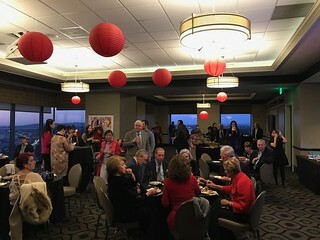 On the evening of November 28th, the Confucius Institute at San Diego State University (CISDSU), along with the San Diego Asian Pacific Community, co-hosted a reception to celebrate San Diego County Supervisor Ron Roberts’ retirement. The event was held in the Six Arts Center at SDSU. At the reception, community leaders delivered speeches to thank Supervisor Roberts, some of whom included, Former San Diego City Councilman Tom Hom, APAPA-San Diego Chapter President Ron Cho, Adobe Bluffs Elementary School Principal Edward Park, Asian Business Association President & CEO Wendy Urushima-Conn, San Diego Asian Film Festival Director Kent Lee, Past Chairman of the Board of the Asian Business Association Lois Fong-Sakai, Board of Directors of the San Diego Chinese Historical Museum Michael Yee, and President & CEO of Focuscom Dan Hom. Lee Ann Kim served as the emcee for the evening. During the event, CISDSU prepared Chinese performances including, Guzheng “Blue and White Porcelain”, Guqin, Seal Carving (later as a gift presented to Supervisor Roberts), and Taichi Kungfu Fan. Supervisor Roberts presented a proclamation to Dr. Lilly Cheng, Managing Director of CISDSU, appreciating her dedication and contribution towards the promotion of Chinese language and culture in San Diego. THANK YOU Supervisor Roberts and we wish him a retirement full of joy and happiness! On November 16th, CISDSU Project Manager Anne Chu and Six Arts Instructors Rensong Li and Dan Liu visited Hilltop High School, a Confucius Classroom School affiliated with CISDSU. 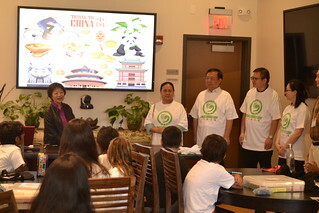 During their visit, Ms. Chu introduced the Chinese Summer Camp Program for High School Students offered by CISDSU. Afterwards, Professors Rensong Li and Dan Liu presented a spectacular Taichi Kungfu Fan performance for the students. Afterwards, Professor Li led a traditional Chinese Martial Arts demonstration. Students followed the instructions to learn some basic Martial Arts techniques, including Horse Stand, Balancing Skills, and etc. 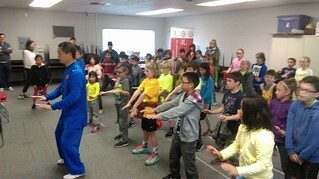 Through the interactive demonstration, students got the opportunity to experience Chinese culture through Martial Arts. On November 15, 2018, the Confucius Institute at San Diego State University participated in the International Peace Village at the Conrad Prebys Aztec Student Union. CISDSU showcased Chinese culture through performances like music, Tai Chi, and martial arts and had elaborate table displays at the event. At noon, CISDSU performers brought to the audience a Guzheng piece called “Blue and White Porcelain”, followed by a Taichi Kungfu Fan performance. Both performances won rounds and rounds of applause from the audience. 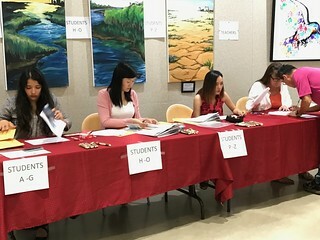 During the event, CISDSU also hosted a table presenting the 2019 Shanghai Summer Program information to students. Here students were able to learn about the study abroad program details, tentative itinerary and scholarships opportunities. 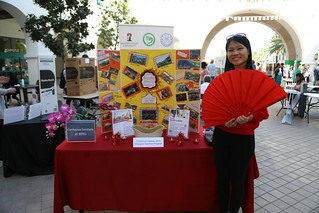 CISDSU supports the International Peace Village event each year to further promote Chinese culture on SDSU campus. Out of all the countries that presented their culture at the event, Confucius Institute won third place in showcasing their culture. Through performances, information session, and decorative table displays, CI was able to reach a number of students and spread awareness for the Chinese culture. 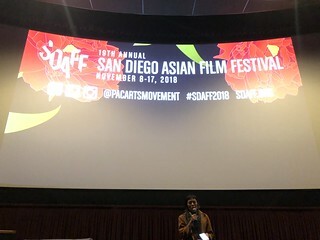 In the evening of November 14, the Confucius Institute at San Diego State University (CISDSU) participated in the San Diego Asian Film Festival screening of “Havana Divas” at the UltraStar Theatre at Mission Valley. CISDSU supports the Asian Film Festival each year as one of the sponsors. There’s absolutely no way of learning and experiencing the Chinese culture without a cup of tea. The Confucius Institute at San Diego State University hosted a Chinese Tea Ceremony at the Six Arts Center on Wednesday, November 14, 2018. 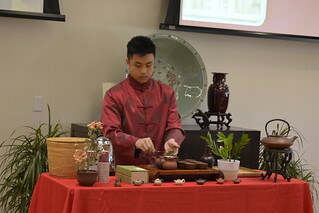 At the event, Tea Master Jason Huang demonstrated how to properly prepare the tea in a traditional Chinese way. At the same time, Professor Dan Liu accompanied the ceremony by playing beautiful Guzheng music in the background. During the event, Ms. Chudan Li introduced the 2019 Shanghai Summer Program to the students. After the information session, Professor Rensong Li led a Tai Chi demonstration to the audience. The students were able to practice the relaxing motions and experience traditional Tai Chi movements. The Chinese Tea Ceremony was a kick-off event for the celebration of International Education Week at San Diego State University. The Confucius Institute is proud to be part of the celebration each year because their goal is to share the Chinese culture to as many students as possible. CI holds events in the Six Arts center and is always welcoming of students. To help share their culture, CI is always brainstorming new ideas to help bring the Chinse culture to SDSU in fun and relaxing ways. The 11th Chinese Proficiency Competition was successfully held in Yunnan Kunming, China, from October 7th to the 21st. The Confucius Institute at San Diego State University (CISDSU), selected student Hafeez Merali（龙伟敏）from El Capitan High School to represent their school in the competition. CISDSU Six Arts Instructor Ms. Dan Liu, led and guided the student during the trip. This two-week program started in Beijing, where students visited many historical sites such as the Great Wall, the Forbidden City, and the Summer Palace. 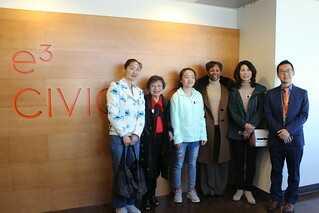 Students had the opportunity to visit the Confucius Institute Headquarter in Beijing, which has an Exploratorium. At the Exploratorium, students experienced a variety of traditional Chinese cultural activities such as calligraphy, listened and played Chinese musical instrument and artifacts, and tried on Peking opera outfits. On October 10th, the students arrived in the city of Kunming for the Chinese Bridge Competition. The competition had a total of five rounds. The Confucius Institute’s team went through the “Bridge-Crossing contest”, which was the first and second round. After the competition, students visited many famous sight-seeing spots in Yunnan and visited two local Chinese families. They visited the Stone Forest, which is known for its tall rocks that create the illusion of a forest made of stone. Students visited a Chinese host family and interacted with local high school students. They had the opportunity to taste the authentic local cuisine and to practice their Chinese. Moreover, students attended the classes at a local university. The classes included paper cutting, calligraphy, tea ceremony, and archery. This two-week program showed students just a glimpse into the culture of one of the largest countries in the world. At the end of the program, the students expressed their gratitude for the opportunity to experience the wonderful cities and culture. Everyone was excited to share their life changing experience with their family and friends. On Monday, October 15, SDSU President Adela de la Torre Visited the Six Arts Center. 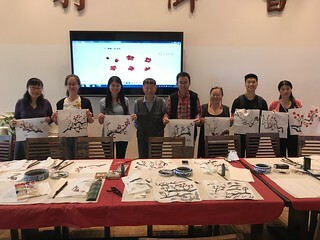 CISDSU Managing Director Dr. Lilly Cheng, Co-Director Professor Cunlu Zhang and all staff members welcomed her with tea, zither music, Taichi, and one-stroke painting. While enjoy a cup of tea, President De la Torre expressed her wishes to further collaborate with CISDSU to strengthen educational programs and cultural exchanges between SDSU and China. On September 29, CISDSU hosted the September Teachers Training at the Six Arts Center. Managing Director Dr. Lilly Cheng presented on the topic of “New Thoughts on the New Silk Road”. Thirty-three Hanban teachers and volunteers attended the training. During the training, the teachers also discussed how to further develop the Six Arts program at Confucius Classroom schools. In the afternoon, CISDSU Co-Director Cunlu Zhang and Project Manager Anne Chu gave an orientation to the new Hanban teachers and volunteers. This fall, CISDSU received nine new Hanban teachers and volunteers. On September 28, led by Chairman of Xiamen University Council Dr. Yan Zhang and Director of the Southern Base of Confucius Institute Headquarters Dr. Tongwen Mao, the Xiamen University delegation visited the Six Arts Center. During their visit, the delegation participated in the Du Nam Xuong Six Arts Welcome Hall Unveiling Ceremony, which was hosted by Mr. David Du, his son Mr. Kurtis Du and guests at the Six Arts Center. In the morning, SDSU representatives, including SDSU Provost Emerita Dr. Nancy Marlin, Dean of Education Dr. Barry Chung, Professor Sam Shen, Professor Cheryl James-Ward, Professor Lois Olson, Professor Gene Lamke, Professor John Cleary, University Development Associate Vice President Ms. Adrienne Vargas, arrived at the Six Arts Center to welcome the guests. Managing Director of CISDSU Dr. Lilly Cheng and Co-Director Cunlu Zhang served as hosts at the luncheon after the ceremony. On Saturday September 22nd, the Confucius Institute at San Diego State University and House of China co-hosted the 2018 Moon Festival Celebration. This has been the fourth consecutive time that the two institutes have come together to host this celebration. The Moon Festival has become one of the city’s biggest events hosted at the historical Organ Pavilion at Balboa Park. This year, about 30,000 people from all over the County of San Diego and beyond, gathered together in the audience and surrounded the area to witness this year’s magnificent performances. At around 5:40 pm, the evening’s program started with a grand performance by the Korean American Community. The group performed an energetic and exciting traditional Korean drum dance. After this grand opening, emcees including Michael Chen from channel 10 news, Confucius Classroom students Kamila Carter, Asha Frye, Leela Zaveri-Tabb, and Texas Zubiller, welcomed the audience to this year’s Moon Festival Celebration in English, Mandarin, and in American Sign Language. The evening’s events featured our partner university - Xiamen University’s Arts Troupe, who performed a danced titled, “National Unity”. 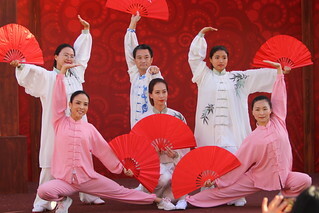 The art troupe later performed group dances: “The Beautiful Scenery”, “The Beauty of Hui’an Women”, and a Chinese entrustments performance called “A Moonlit Night on the Spring River.” A Singer from Xiamen University and a Confucius Classroom student Leah Markworth performed together a traditional Moon Festival song, “The Moon Represents My Heart”. The professional Chinese performances brought by Xiamen University Arts Troupe were the highlights of the evening. Confucius Classroom students from Barnard Asian Pacific Language Academy, Adobe Bluffs Elementary School, and Riverview International Academy, provided extraordinary programs to celebrate the Moon Festival. The students from Barnard Elementary performed a musical called “Mulan,” which was adopted from the story of Hua Mu Lan from ancient China. Next, the students from Adobe Bluffs Elementary sang, “Wishing We Last Forever” in Mandarin. The students from Riverview International Academy, a Confucius Classroom (CC), also gave a magnificent and jaw dropping Chinese Yoyo performance. The flying LED yoyos, the energetic music, and daring tricks by the student, left the audience in awe. Another group of Riverview International Academy students also left the audience amazed with their Kungfu Fan performance. Later, Barnard Elementary students performed a Yi minority dance called, “July Torch Festival.” Friends and staff of the Confucius Institute also participated in this year’s celebration. A Chinese Martial Arts performances was done by Six Arts Instructor Rensong Li, Taichi Master Siu-Fong Evans, senior citizens and CC students. A Guzheng and Chinese Dance, One Stroke Painting was performed by CI Staff and CC students. Afterwards, Christopher Adamson took the stage to show the audience the magic of the Chinese abacus. This year’s celebration was bigger than previous years. The afternoon program started with a rocking performance from the classic rock band, “The Internationals.” A band in which Principal Edward Park from Adobe Bluffs Elementary is a member. Afterwards, 12 students from the Mission Bay High School Jazz Band delighted the audience with a mixture of New Orleans jazz and a few traditional Chinese songs. The festival also included new performers, such as the Meenal’s Academy of Performing Arts who performed a beautiful Indian classical dance, Kathak set to a contemporary fusion track. On September 21, 2018, Xiamen University Arts Troupe visited Confucius Classroom School Adobe Bluffs Elementary School. The Troupe brought to the students beautiful Chinese dances, martial arts, and Chinese instruments performances. Over 400 students and teachers welcomed the group and watched their performances that day. Xiamen University Dean of Arts College, Mr. Yuanzan He, commented after visiting the school: “I am very impressed with the students’ Chinese proficiency level at Adobe Bluffs.” This year, Adobe Bluffs just started their Mandarin Immersion Program. The school officially established to be a Confucius Classroom School in 2017. 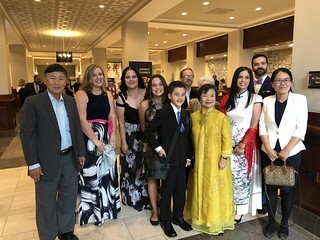 The 2018 the Confucius Institute National Honors Gala celebrated the best that each Confucius Institute community around the US has to offer. Two people who were honored at the event in Washington DC on September 15th were Kamila Carter and Love Zubiller, both of whom are active members of the Confucius Institute at San Diego State University (CISDSU). 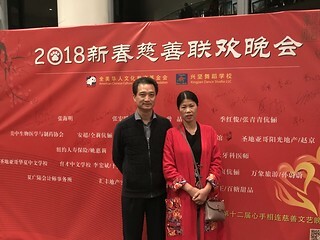 Kamila and Love were among several hundred people throughout the U.S. who submitted essays about their Confucius Institute experience to the 2018 People-to-People National Essay Competition. The two of them were selected along with eight others to travel to Washington, D.C. to receive their honors. Kamila is a student at Tierra Del Sol Middle School in Lakeside. In her essay titled, "Life of a CODA - Child of Deaf Adults" she wrote about growing up in a multilingual family. Not only does she speak three languages --English, Spanish, and Mandarin, but she also fluent American Sign Language. Kamila is a dynamic seventh grader who enjoys cheerleading and tumbling but she is also a fierce competitor at Chinese Bridge. She won first place in the competition in 2017 and has gone on to repeat her winning performance of the "A Thankful Heart" interpretive dance throughout the world. A highlight of the gala in Washington, D.C. was watching Kamila perform "A Thankful Heart" live on stage during the awards ceremony. There was not a dry eye in the Gala. Love's story was written from a different perspective than the other winners. As a mom of two Chinese immersion students, she herself is not a prolific speaker of Chinese (at least not yet). She had the opportunity to travel to China with her son Texas and the Confucius Institute for the 2017 ShenMo International Abacus Competition. In preparation for the trip, she spent a year trying to capture an introductory understanding of the Mandarin language. While she struggled to learn the most basic elements of the language, her kid's fluency flourished. Love retold the highlight of her trip to China to gala attendees -- when she successfully purchased a dress in Beijing only speaking in Mandarin. The fact that this happened in front of her son was a particular source of pride for her. Love thanked her children for inspiring her every day with their determination to learn Mandarin. She also recognized Dr. Lilly Cheng of the Confucius Institute at SDSU for bringing Chinese cultural arts programs to her children and their peers at Barnard Mandarin Magnet Elementary School. According to Love, it is the arts that give the language its magic. The Confucius Institute opens the People-to-People National Essay Competition to Chinese learners throughout the U.S. every year. Like so many others in San Diego and beyond, Kamila and Love have a story to tell about their love of China and their appreciation for the Mandarin language. Think you have a good story to tell? Just wait until the competition opens up in Spring 2019. On September 9th, the Bohua Academy of Chinese Musical Arts held a concert at the Poway Center for the Performing Arts in San Diego. Since spreading the culture is an important aspect of the Confucius Institute at San Diego State University (CISDSU), we were invited to participate in the concert. CISDSU Six Art instructor Dan Liu performed a song called, “Jiang Yue Chang Xiang” on the traditional Chinese instrument Guzheng. Also, she was part of the orchestras led by Conductor Lianxiang Liu. All of the performances breathtaking programs for the audience to enjoy visually and auditorily. The concert was not only made by the performers who stood on stage, but also everyone who worked behind the scenes. 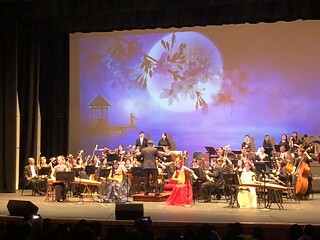 With their dedication to express and educate people on the importance of Chinese culture, the Bohua Academy of Chinese Musical Arts put on a wonderful concert that connected with the audience. 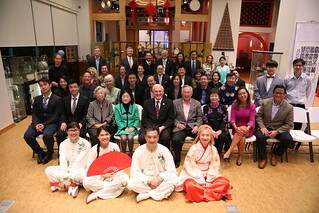 On September 6, 2018, the Confucius Institute at San Diego State University hosted a retirement banquet for the San Diego County Supervisor Ron Roberts. Over 400 guests from government, companies, and educational institutes attended the banquet. At the dinner, Dr. Lilly Cheng and Mr. David Du gave heartfelt speeches to convey their appreciation of Supervisor Roberts and to celebrate their many years’ of friendship together. CISDSU staff member Ms. Chudan Li served as the emcee for the evening. During his term, Supervisor Roberts expressed his appreciation of Chinese culture and language. Since he believes that today’s world leaders should speak more than one language, he encourages multilingual education. 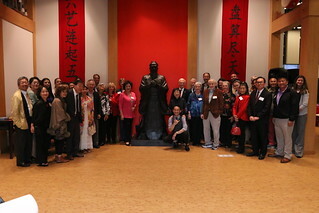 This year, on behalf of the San Diego County board of supervisors, Supervisor Roberts donated a statue of Confucius to the Six Arts Center at San Diego State University. He also visited the Confucius Institute Headquarters (Hanban) in Beijing, China to discuss future collaboration opportunities between Hanban and San Diego. During the banquet, CISDSU team presented a gift to Supervisor Roberts: a one-stroke-painting of a horse, which is his Chinese zodiac sign. Supervisor Roberts has not only made great contributions to San Diego, he is also committed to building bridges between China and the United States. We wish him the best on his journey after retirement. On August 16, 2018, the Confucius Institute at San Diego State University (CISDSU) participated in the Open House hosted by the Consulate General of the People’s Republic of China in Los Angeles. During the event, CISDSU students impressed the guests with their Six Arts talents. “I would like to thank the teachers and students from CISDSU for your commitment and dedication to the Chinese language education and cultural exchanges. Also thank you very much for bringing us the wonderful Chinese culture performances today.” remarked by the Consul General Zhang Ping. At 4:00pm, CISDSU “Six Arts Family” – the Abbouds kicked start the event with Lion Dance and Chinese gong and drum. Their 6th grade triplets Tasie, Luca, Ava and 8th grade sister Magdalena became two little lions: red and purple, which are the auspicious colors in Chinese culture. Their performance presented the liveliness and humorousness of the lions. CISDSU students Kamila Carter and Texas Zubiller served as trilingual emcees (Chinese, English and American Sign Language). The performances included Guzheng, tea ceremony, Fan dance, Taichi Kungfu Dance, Abacus, Peacock Dance and Chinese speech. During the interactive program, Texas changed into chef costume, preparing to showcase how to make dumplings. He invited Consul General Zhang Ping, Dr. Lilly Cheng, CISDSU Managing Director and guests for the dumpling making. The event ended with a Chinese style buffet. The multitalented students from CISDSU were the highlight of the evening. The Open House event deepens the guests’ understanding of Chinese culture and strengthens the friendship between China and USA. On Monday, August 13, Professor Wai Ng warmly welcomed our Confucius Institute team to his house for a taste of Six Arts: Chinese calligraphy & painting, Chinese tea ceremony and Chinese orchestra music. At noon, Professor Wai Ng and his family greeted us at Fung Fung Yuen restaurant in Mira Mesa. Guests and hosts enjoyed a great meal of dim sum and great conversations. 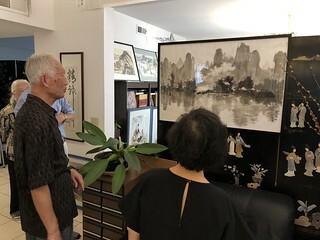 Afterwards, Professor Wai Ng showcased some of his beautiful Chinese paintings and calligraphies at his house, followed by Chinese tea ceremony and tasting, and Chinese & western orchestra music. During tea ceremony, he introduced us to three types of tea: green jasmine tea, Taiwanese green tea “Biluochun”, and puer tea. Professor Ng is a talented artist with an engineering background. He started to learn painting in 1997 after his retirement and now he has become one of the top Chinese painting artists in San Diego. All the guests are impressed with Professor Ng’s talents in Chinese culture and are grateful for his hospitality. The Confucius Institute Six Arts Summer Camp was held at SDSU Six Arts Center from Monday, July 30th to August 10th, 2018. This two-week summer program focused on Chinese culture and language. The mission of the camp was to develop and improve the students’ proficiency in Chinese through Chinese classes and Chinese cultural activities. The theme of this year’s Chinese class is “Ten Days Travelling in China.” By visiting six regions (Northeast, North, Central, Northern Frontier, Western and South) in China, students learned different regions’ cultures, landscape and foods. Additionally, some famous cities were also introduced so students. After class, many students excitedly expressed that they look forward to visiting these places in the future. A variety of Chinese cultural activities enriched our students’ summer camp experience. They made the Peking Opera Mask, wrote Chinese calligraphy with the Chinese calligraphy brush, did paper cutting and folding, and watched a tea ceremony demonstrated by Chinese teachers followed by tea tasting. On the last day of the camp, parents were all invited to the Six Arts Center for the closing ceremony. Students showcased what they have learned during the two weeks. 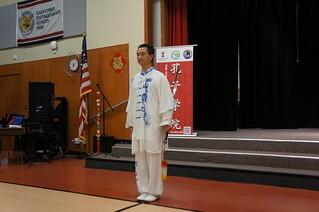 Students performed Chinese singing and dancing, Chinese drama, mental math and Taichi. Parents were so delighted that their children had the opportunity to keep learning and sharpening their Mandarin skills through the summer camp. Students all expressed that they would love to come back to the summer camp next year. On August 9, 2018, Adobe Bluffs Elementary School held a special night to introduce their first ever Mandarin Immersion Program for kindergartners. This inaugural group is composed of 26 families. Penny Jingpei Wang, the new Mandarin teacher, introduced herself to the group. Kudos to ABES. On June 25th, 2018, the Confucius Institute at San Diego State University (CISDSU) participated in the Cultural Connections event. This event was held by KPBS. CISDSU was invited to attend this event and had a presentation of cultural differences between the U.S. and China and the history of China. CISDSU’s managing director, Dr. Lilly Cheng and SDSU professor, Dr. Samuel Shen presented an insightful and informative presentation to KPBS staff. 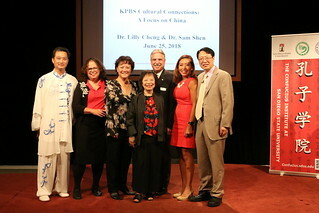 The presentation introduced the history of Chinese people immigrated from China to the U.S. and San Diego Chinese community. 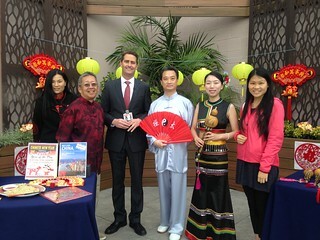 KPBS staff learned about the cultural differences between China and U.S.. In addition, CISDSU catered for this event and brought many traditional and authentic Chinese cuisines such as Sichuan-style cold noodle, sesame balls and Chinese cucumber salad, and had a Taichi demonstration and provide an option for KPBS staff to relax their mind under an intense working environment. This event is one of Cultural connections presentations and the purpose of this series of presentation is to learn about new cultures and gain a better understanding of how our diverse communities contribute to our society. From June 18th to 22nd, students from elementary and middle schools participated in the SDSU Imperial Valley Campus (IVC) Chinese Summer Camp. 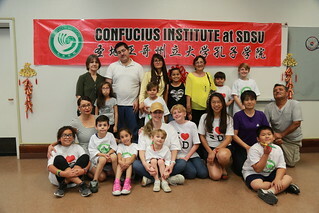 The summer camp was hosted by the Confucius Institute at San Diego State University-IVC (CISDSU-IVC). Centered on the “Six Arts” cultural experience, the summer camp offered students a better understanding of China and Chinese culture. The Chinese Summer Camp held by CISDSU-IVC, has become a cultural brand that enriches the community’s culture and meets the needs of their residents. Many community members enjoy learning the “Six Arts”. Many camp parents and students remarked that they would love to come back to the camp next year and expand their knowledge of the Chinese culture. 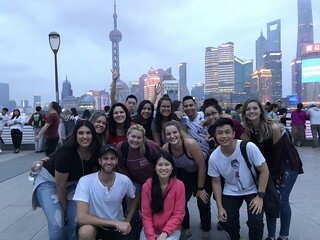 On June 2, 2018, 13 San Diego State University students embarked on a 15-day journey to Shanghai, China with the Confucius Institute. This annual program began with the largest metropolis city of China - Shanghai, with day trips to nearby destinations including Suzhou, Hangzhou, and Xitang Water Village. The program was hosted in East China Normal University where students stayed as international students for two weeks. During the program, students was introduced to many aspects of Chinese culture, including visits to Buddhist temples, Zen Meditation Center, Face Changing Opera, Traditional Chinese Medicine Center, Yu Garden, Disneyland, Shanghai Museum and multiple company visits etc. CISDSU Program Coordinator, Ms. Chudan Li led the students to multiple sites and visits during the two-week program. Faculty leaders of the program were Dr. Lilly Cheng, Managing Director of CISDSU, and Dr. Lois Olson, Professor of Marketing, who introduced and discussed many cultural concepts in depth with the students. “I will never forget the memories I made in China, and I can truthfully say that it was one of the best times of my entire life.” One of the 18’ program students, Anthony, commented about his experience after he returned to San Diego. If you would like to follow our students’ journey, please subscribe to our newsletter for their stories. 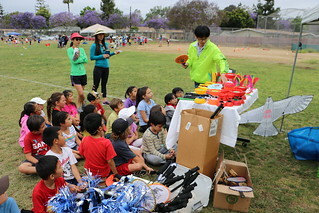 On June 6th, 2018, Confucius Institute at SDSU (CISDSU) participated in Barnard Field Day to introduce Chinese outdoor games and cultural activities to students, teachers and parents. Barnard Field day is held annually for students so they have the opportunity to experience different sports, keep in good shape and participate in diverse cultural activities. There are 14 stations, each station hosted a different activity such as Chinese YoYo, surfing, martial arts and Taiko. Students from K to 5th got the chance to stay in each station for 15 minutes and then move on to the next station. CISDSU ran a station for students to learn how to play traditional Chinese cultural games like shuttlecock, Chinese badminton, kite and yo-yo. Students tried all the games and had a lot of fun. Students also learned about Chinese culture, which helped them to understand and appreciate a different culture. The event was a huge success. On June 6th, 2018, Empower Charter School held an event of Celebration and Exhibition Day to showcase the school’s academic programs and to celebrate the launch of their mandarin program. 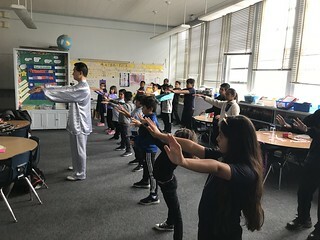 ASix Arts Instructors of the Confucius Institute at San Diego State University (CISDSU), Professor Rensong Li, was invited to demonstrate Tai Chi with the students who attended the Tai Chi class in May. The performance was warmly welcomed and amazed by the school administrators, teachers and students. On May 27th, 2018, the annual Ethnic Food Fair was held at Balboa Park, San Diego. At the international cottages, thousands of visitors were attracted to the cultural performances at the Fair. CISDSU Six Arts instructor Professor Rensong Li was invited to showcase the Chen style Tai Chi. His performance was received rounds of applause from the audience. On May 24, 2018, the Confucius Statue Unveiling Ceremony was held at the Six Arts Center. President of San Diego State University (SDSU), Sally Roush hosted the ceremony. San Diego County Supervisor Ron Roberts and President Sally Roush unveiled the Confucius statue together. The ceremony was to dedicate the Confucius statue of the Six Arts Center. On May 20th, 2018, the Buddha’s Birthday Celebration was held at Hsi Fang Temple. CISDSU Six Arts instructor Professor Rensong Li and students were invited to demonstrate Chinese regimen cultures of Taichi Kung Fu Fan and Health Qigong Ma Wang Dui Dao Yin Shu. On May 18th, 2018, the Confucius Institute at San Diego State University (CISDSU) hosted the 2018 Spring Chinese Painting Class closing ceremony at Six Arts Center. At the closing ceremony, CISDSU staff members Ms. Chudan Li and Professor Rensong Li presented appreciation certificate to class instructor, Mr. Kegong Li. The closing ceremony ended with a celebration potluck. All participants showcased their paintings and celebrated their accomplishments throughout the semester. Starting from January, Mr. Kegong Li designed his Chinese painting curriculum for CI teachers and students. Painting subjects included bamboos, pandas, chicken, crabs, cherry blossoms, gold fish, sparrow, and grapes etc., tailored to the teaching of Six Arts in Confucius Classrooms. At the end of the semester, participants are able to master painting these subjects beautifully and skillfully. Mr. Kegong Li retired from Institute of the Xi’an Academy of Arts. He specializes in teaching children paintings and calligraphy. Currently he is a member of the Chinese Arts Association in Los Angeles as well as a member of the San Diego Calligraphy and Arts Gathering Club. Again, special thank you to our Chinese Painting class instructor Mr. Kegong Li for his dedication in promoting Six Arts in San Diego. Barnard Mandarin Magnet Elementary School parent Love Zubiller presented at this year’s National Chinese Language Conference (NCLC) in Salt Lake City, UT, on May 17. NCLC is the largest annual conference of leaders and practitioners in the field of Chinese language and culture education in North America. It aims to enhance Mandarin immersion education by sharing best practices among educators and policymakers. Zubiller, whose son is in fourth grade and daughter is in first grade at Barnard, spoke about being the parent of Mandarin language learners. She focused on the idea that learning the language also means learning and embracing the Chinese culture. She discussed how the Confucius Institute of San Diego State University, in partnership with Barnard, gives all students at the school a well-rounded, holistic, and meaningful cultural education through the implementation of arts and culture classes, such as Chinese dance, poetry, music, tai chi, abacus, and more. Through the Confucius Institute, one such opportunity came in summer 2017 when Zubiller and her son traveled to Beijing so that he could participate in an international abacus competition that included 800 students from every part of China. At first, the locals were shocked by her son’s language fluency. However, once they got over the surprise of hearing a blond-haired, blue-eyed American boy speak conversational Mandarin, he became just one of the kids. Together, they experienced a poignant moment during the competition: all of them using an ancient Chinese calculator in a very modern setting. After taking home a second place trophy at the competition, he delivered a speech in Mandarin in front of 1,500 native Chinese speakers – an event that was also televised. It was a once-in-a-lifetime opportunity that would not have been possible without the multi-faceted education he receives through Barnard’s partnership with the Confucius Institute. To Zubiller, the trip was the perfect culmination of her son’s Mandarin language skills mixed with his cultural education. She hopes that sharing her experiences and thoughts on her children’s success at Barnard will inspire Chinese language educators to bring similar combined language and culture programs to classrooms across the USA. In the morning of May 7th, 2018, Six Arts Instructors of the Confucius Institute at San Diego State University (CISDSU), Professor Rensong Li and Ms. Dan Liu, arrived at Linda Vista Elementary School. They brought to the school a wonderful Chinese culture presentation. Linda Vista Elementary School has not yet developed a Chinese program, but students already showed great curiosity to Chinese culture. They were sitting in the auditorium waiting patiently for the program to start. To begin the program, Professor Li and Ms. Liu introduced themselves and their performances. The first performance was a Taichi Fan performance, prompting a massive cheer from the audience. 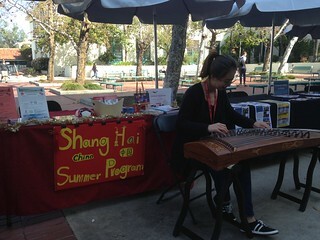 Afterwards, Ms. Liu performed the traditional Chinese instrument Guzheng. Then, Professor Li showcased the Chen style Taichi Boxing. The performance ended with Ms. Liu’s Han Dynasty Dance “Ta Ge”. After the performance finished, the students gave them rounds of applause. Many students came up to the stage and asked the two teachers how they can learn more about Chinese Culture. They hope that in the future we will be able to bring in more Chinese culture to the students. On May 6th, 2018, the 2018 Chinese Bridge Summer Camp Pre-Departure Orientation was held in San Diego Library Mission Valley Branch. 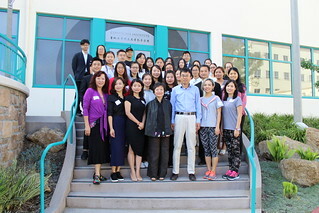 The orientation was hosted by Project Manager Ms. Anne Chu, and Hanban teachers of the Confucius Institute at San Diego State University (CISDSU). Over 80 students and parents participated in the meeting. 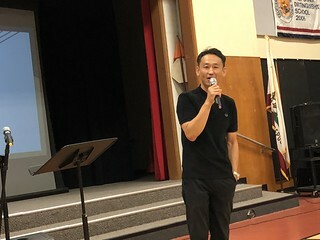 At the meeting, Ms. Chu introduced that the summer camp will be divided into two groups: 37 high students and 10 educators, with 5 teacher leaders. She then introduced the program’s host university – Xiamen University, as well as curriculum and activities offered by the program. For many students and educators, it will be their first time to China. Ms. Chu explained to them the differences on food, life and culture between China and the U.S., which helped the participants understand China and better prepare for their trip. At the Q&A session, many parents and students asked questions followed by Ms. Chu’s answers. At the end, CISDSU presented gifts to all participants and wished them a great journey. On the evening of May 5th, the Fifth American Chinese Youth Art Festival was held in Poway Center for the Performing Arts in San Diego. It was a fantastic Arts Festival. 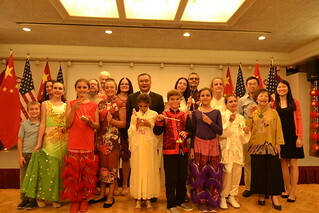 The American Chinese Youth presented their talent and elegant demeanor to the audience. The Confucius Classrooms of Confucius Institute at SDSU, Barnard Asian Pacific Language Academy and Adobe Bluffs Elementary School performed a musical called "Mulan" and a recitation of the poetry, "I Love Mum". Their performances were warmly welcomed and won rounds of applause from the audience. On May 5th, 2018, the Confucius Institute at San Diego State University (CISDSU) participated in the 9th Annual Asian Cultural Festival. The festival was held in Mira Mesa Senior Center. This year, CISDSU brought to the audience the Six Arts Performance, performed by Confucius Classroom (CC) students and teachers. The program was emceed by CISDSU Managing Director Dr. Lilly Cheng, co-emceed by CC students Leah Markworth, Christopher Santy and Kamila Carter. The Six Arts Performance included lion dance, Yi minority dance, Erhu instrument, Han dance, one-stroke painting, abacus, Chinese yo-yo, Taichi and Chinese sign language song. 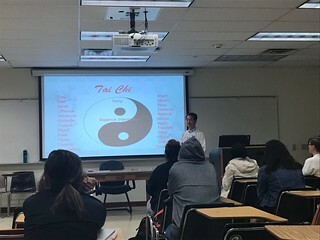 On April 30th, Confucius Institute Six Arts Instructor, Professor Rensong Li , invited Professor Jocelyn Killmer of San Diego State University (SDSU), conducted a special presentation of Chinese Martial Arts in Asian Thought and Culture class at SDSU. To begin the class, Professor Li introduced Chinese Martial Arts’ extensive and profound history. There are many different schools of Martial Arts. As a Martial Arts teacher for more than 20 years in Xiamen University, Professor Li has taught Chinese boxing, Chinese kick boxing, self-defense skills, Judo, Tai Chi Chuan and Chinese Health Qigong. During the class, Professor Li explained that practicing Taichi Chuan and Chinese Health Qigong not only can strengthen the body, defend oneself, but also can deeper one’s understand of Chinese culture through the movement practices. Mr. Li Rensong introduced the Yin-Yang relations through the Taichi Chuan movements of ascending and descending, opening and closing, inhaling and exhaling, deficiency and excess, dynamic and static, fast and slow, rigid and flexible by showing a Tai Chi diagram. He emphasized the importance of the balance of Yin and Yang in sports and life, the principle of harmony among human being, nature and society. 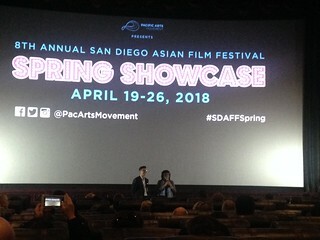 On April 19th, the Confucius Institute at San Diego State University (CISDSU) attended the opening night of the San Diego Asian Film Festival Spring Showcase. The opening night movie “Meditation Park” screening was held at UltraStar Theatre at Mission Valley. CISDSU participated in the event as one of the community ticket sponsors. On April 14, 2018, the North American Confucius Institute Western Regional Conference was held in San Diego State University (SDSU), hosted by the Confucius Institute at San Diego State University (CISDSU). A total of 23 Confucius Institute (CI) directors and co-directors participated in the conference. The theme of this year was “New Silk Road, New Six Arts”. During the Directors’ Forum in the morning, Confucius Institute at University of California, Los Angeles Director Susan Jain, Confucius Institute at San Francisco State University Director Jiaxin Xie, and Confucius Institute at University of Alaska Anchorage Director Ping Zeng shared their programs and experiences. 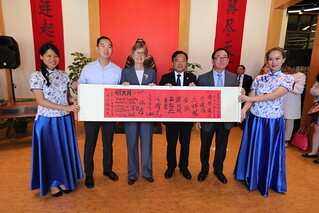 Session Chair, SDSU Provost Emerita Dr. Nancy Marlin concluded that “it is important for the Confucius Institutes around the globe, as professional Chinese education organizations, to share experience and promote the education of Chinese language and culture”. 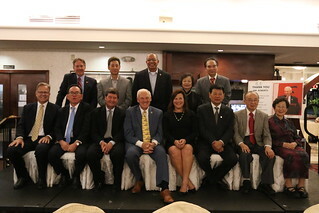 Other speakers of the Conference included Ron Cho, President of Asian Pacific Islander American Public Affairs (APAPA) -San Diego Chapter; Johnny Lee, Board Secretary and Board of Directors, APAPA-East Bay Chapter; Tom Hom, First Chinese American City Council Member in San Diego. They spoke from the Asian American history perspective and today’s political environment perspective, about how the Confucius Institute has contributed to San Diego’s culture and education industry. After that, Lois Olson, Professor of College of Business Administration at SDSU, and Cheryl Ward, Professor of Educational Leadership at SDSU, both stated that it is important to collaborate closely with the Confucius Institute, to develop study abroad programs in China for SDSU’s undergraduate students, graduate students and doctoral students, therefore to foster cultural understanding among the young generations from China and the U.S.. The “Six Arts” is the main theme of the conference. How to engage “Ritual, Music, Archery, Chariot-driving, Calligraphy and Mathematics” into Chinese language and culture teaching becomes the topic of interest for many Confucius Institutes. In order to showcase the outcome of “Six Arts” program, CISDSU prepared the “East Meets West” lunch banquet for the guests, which was hosted by Friends of the Confucius Institute at Six Arts Center. From Devil Egg to Tea Egg, from cold noodles to spaghetti, from American hot wings to Chinese yam salad… every item on the menu reflected the fusion of eastern culture and western culture. It was not only a feast for the eyes, but also a delight to the taste buds. In the afternoon, over 30 Confucius Classroom students and teachers brought to the audience the Six Arts Performance: Chinese tea ceremony (ritual, music), Chinese ballet “Butterfly Lovers” (chariot-driving), one-stroke painting of dog (calligraphy), Miao minority dance (chariot-driving), Taichi Fan (archery), the magic of abacus (mathematics) and Chinese sign language “A Thankful Heart” (ritual, music). The audience was impressed by the talents of the students. The performance demonstrated that the new concepts of Six Arts have been intergraded into the curriculum of Confucius Classrooms. Our children learn Six Arts in their classrooms; they perform Six Arts on stage. Six Arts have gained great popularity among families and communities. As Confucius Classroom ambassadors, Chinese Bridge champion family the Carters used sign language to speak about their two children, Kamila Carter and Tod Carter, embracing different languages. They learn Chinese, American and Mexican sign languages, Spanish and Chinese. Chinese Bridge champion Leah Markworth spoke about her unforgettable journey to China in the last summer, through a Confucius Institute summer program. Furthermore, vision-impaired student Christopher Adamson, though cannot see the beads on an abacus, uses both hands to learn the ancient calculator from China. He spoke about his journey to an international abacus competition this spring. 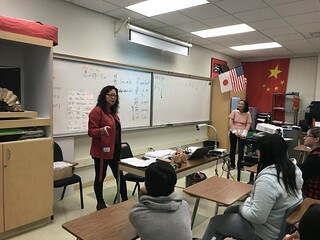 Confucius Institute teacher from Barnard Ms. Jing Zhang and Confucius Institute teacher from Riverview International Academy Ms. Leixia Liu shared their teaching experiences in Confucius Classroom schools in San Diego. The closing ceremony was hosted by CISDSU Managing Director, Dr. Lilly Cheng and Co-Director, Professor Cunlu Zhang. Directors from CI at University of Arizona, CI at Clark County School District, CI at Southern Utah University and scholars from Stanford University also concluded the program. The conference ended with rounds of applause from the guests. The Confucius Institute, while exploring the “New Thoughts on the New Silk Road”, needs to trace back and renew our ancient educator Confucius’ Six Arts concepts. In the era of the New Silk Road, CISDSU implements the Six Arts in its Chinese language programs, which provides valuable experiences for many other Confucius Institutes. The Confucius Institute will need to further understand, promote and develop Six Arts around the world. 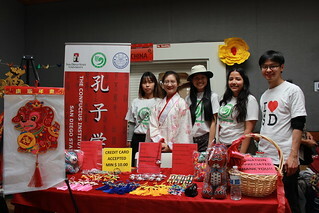 On March 20, 2018, Confucius Institute at San Diego State University (CISDSU) participated in El Capitan High School’s multicultural festival to support its Mandarin language and cultural program. The fair aims to create a more diverse environment for students to experience and appreciate. CISDSU hosted a booth where CI staff wrote students’ name in Chinese. In addition, Professor Dan Liu and Rensong Li demonstrated Chinese Fan dance to students and teachers. 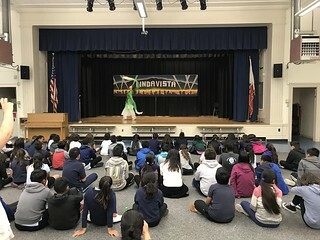 Students not only enjoyed the show, but also want to learn more about how to do the fan dance and history of fan dance. This fair was a great success. Students experienced diverse cultures but also showed huge interest in learning different cultures. 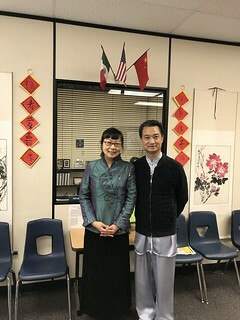 In the afternoon of March 16th, the Confucius Institute at San Diego State University (CISDSU) invited Hanban Chinese teachers to the Six Arts Center for them to share their experiences on coaching the students who participated in the 2018 Chinese Bridge Language Proficiency Competition. During the meeting, the Hanban Teachers were able to learn from each other as they exchanged their ideas and tutoring experiences. At the end of the meeting, all of the teachers expressed how glad they were for having this meeting and benefiting from it. They not only learned how to deal with different kinds of students, but they were also able gain more knowledge about teaching the Chinese language. 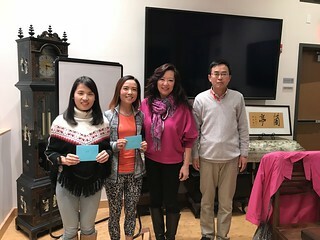 At the end of the meeting, Anne Chu, office manager at CISDSU, and Professor Zhang, co-director of CISDSU, presented gifts to two teachers: Jing Zhang and Jie Zhai. These teachers were awarded for their dedication, as they spend their free time tutoring students in need, and they also did their best to assist students and prepare them for the competition. The competition resulted in a huge success. The first place winners were all Confucius classroom schools’ (CC schools) students; this is a reflection of the support that the Mandarin programs at CC schools have received from school districts, teachers, students and parents. On March 09, 2017, the Confucius Institute at SDSU (CI SDSU) participated in the Run2Play Health & Fitness Day event which was hosted by Adobe Bluffs Elementary School and aims to promote health and fitness as well as to expose students, parents and teachers to different cultures. 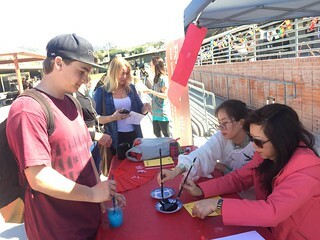 CI SDSU represented the Chinese Outdoor Activities station and introduced Chinese activities to students, teachers and parents. At the station, students not only learned how to play traditional games with the Jianzi (shuttlecock), the Chinese Yo-Yo, badminton, and Taichi, a Chinese martial art which was instructed by Professor Rensong Li. Students also learned about the origins of these activities from CI staff Muting Huang. All the students enjoyed the activities and left for their next station with great excitement but reluctance. The event was a huge success. Students not only enjoyed playing these Chinese outdoor activities, but also learned about the history of these activities and appreciated a different culture. On March 6 and 7, 2018, the Consulate General of the People’s Republic of China in Los Angeles and the Confucius Institute at San Diego State University (CISDSU) co-hosted the 2018 South-West Region Chinese Bridge Language Proficiency Competition at the Pacific Beach Middle School auditorium. One hundred and twenty-one contestants participated in the competition this year, outnumbering all past competitions. 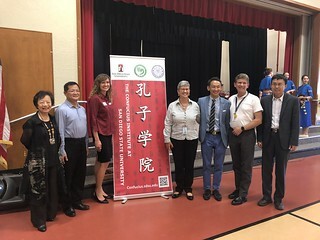 Consul Haiying Chai and Qian Cao from the education office at the Chinese General Consulate in Los Angeles, Principal Aida Hernandez from Barnard Asian Pacific Language Academy, and Principal Brian Thurman from Riverview International Academy attended the event. Dr. Lilly Cheng, Managing Director of CISDSU, served as the emcee. The contestants were divided into four groups based on their grade: 2nd-3rd grade group, 4th-5th grade group, 6th-8th grade group, and 9th-12th grade group. The contest consisted of three parts: a speech, a talent show, and a quiz on Chinese culture and history. The speech topics were “Fun,” “Family,” “Friend,” and “Bridge” for the four groups respectively. 9th-12th grade contestants were required to complete an additional quiz, which contained 50 multiple choices on Chinese culture, history, geography, and national conditions according to the rules of Chinese Bridge World Competition. All the contestants delivered their speech fluently and confidently and demonstrated their impressive Chinese talents including Chinese songs, dance, calligraphy, instruments, martial arts, lion dance, and Chinese yoyo. Among all the excellent contestants, Kayla Warner from Barnard Asian Pacific Language Academy, Russell Boyer from Fletcher Elementary School, Leah Markworth from Pacific Beach Middle School, and Hafeez Merali from El Capitan High School were awarded the first place in 2nd-3rd grade group, 4th-5th grade group, 6th-8th grade group, and 9th-12th grade group respectively. The 2018 Chinese Bridge Competition has exceeded the past ones in scale and contestants’ performance. The enormous improvement is the result of the year-long effort of the Confucius classroom teachers and an affirmation of the immersive Chinese language program introduced by CISDSU. The success of this year’s competition couldn’t be achieved without the months’ thoughtful preparation of CISDSU and the help and the support from CISDSU staff, Hanban teachers and volunteers during the competition. In the morning of March 3rd, the Confucius Institute at San Diego State University welcomed a delegation of forty students from UCLA's South East Asian Campus Learning Education and Retention program (SEACLEAR). CISDSU Managing Director Dr. Lilly Cheng, Co-Director Professor Cunlu Zhang greeted the group at Six Arts Center. Dr. Lilly Cheng introduced CISDSU’s Chinese teaching and cultural exchange programs to the guests, and invited them to discuss with APAPA members. Through the visit, the delegation learned more about the Confucius Institute as well as the Asian Pacific Islander American Public Affairs (APAPA). The Chinese traditional Lantern Festival landed on March 2nd this year. In the evening, the San Diego Chinese American Association held a banquet to celebrate this festival at the Mandeville Auditorium, University of California at San Diego (UCSD). 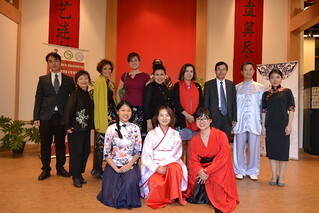 CISDSU Managing Director Dr. Lilly Cheng, Co-Director Cunlu Zhang and Six Arts Instructor Rensong Li attended the event. 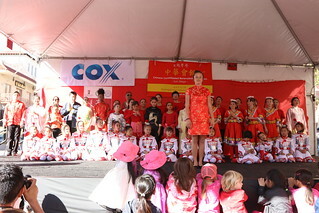 On February 24th and 25th, the Annual Chinese New Year Fair was held on Downtown San Diego, on 3rd Ave and J Street. Thousands of visitors from all around San Diego County participated in this event to celebrate the Chinese New Year. On the main stage, one of the performances that caught the audience’s attention was the Six Arts Performance, presented by the Confucius Institute at San Diego State University (CISDSU). The Six Arts Performance included a lion dance, a Mulan musical, a Guzheng performance, a one-stroke painting demonstration, a Tibetan dance, a Hulusi performance, a Peacock dance, a Taichi Fan performance, an abacus demonstration, and a Chinese Sign Language and Chinese song performance. To start the program, the Abboud family, also known as the “Six Arts Family”, performed the Lion Dance to bring the best of luck for the New Year. The emcees of the program were Confucius Classroom students from Pacific Beach Middle School, Leah Markworth and Christopher Santy. Their fluent Chinese skills made a great impression on the audience. The Mulan musical, presented by Confucius Classroom students from Barnard Elementary School, showcased the scene when Mulan joined the military training on behalf of her father. Afterwards, CI teacher Esther Zhu and student Tasie Abboud simultaneously presented a Guzheng instrument performance and a one-stroke painting demonstration of a dog. Students from Barnard also performed a Tibetan dance called “Tibetan Blue”. The Chinese Bridge Competition champion Kassia Love and TDS Middle School student Harmony Richardson jointly gave a Hulusi performance and a Peacock Dance titled “A Happy Peacock”. In addition, Hanban teachers, led by Six Arts Instructor Professor Rensong Li, performed the “Taichi Kungfu Fan”. One of the most important elements of the Six Arts is “Shu” (Mathematics), which was represented by the Abacus. 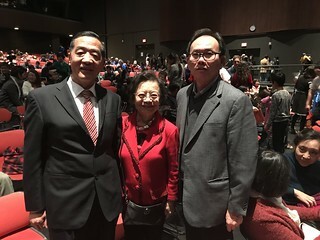 In the performance “The Magic of Abacus”, the President of Shenmo Education Group, Mr. Mianjun Li, and the Managing Director of CISDSU, Dr. Lilly Cheng, hosted the program together. Confucius Classroom students Luca Abboud, Valentina Herrera, Kassia Love and Christopher Adamson showcased their exquisite abacus skills to the audience. 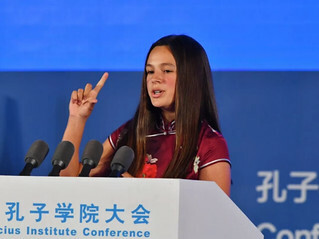 Afterwards, TDS Middle School Student Kamy Carter performed a Chinese Language song “A Thankful Heart” in Chinese sign language, and was followed by Leah Markworth singing a Chinese New Year song “Gong xi gong xi”. All the performers sang together and wished the audience a Happy Chinese New Year. The Six Arts are the core of CISDSU’s education in its 23 Confucius Classrooms and Confucius Classroom schools. 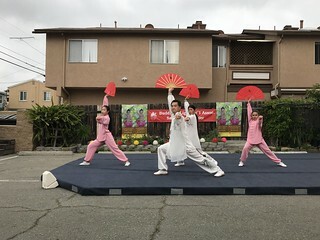 Each year, CISDSU presents the Six Arts in many cultural festivals and events all around San Diego, providing opportunities for Confucius Classroom students and teachers to showcase their Six Arts talents. The Six Arts will be an important theme for this year’s upcoming Chinese Bridge Competition, which will be held in March. Through years of development, CISDSU’s Six Arts have become a great model for teaching Chinese language and culture in San Diego and in the United States. On February 23, the Confucius Institute at San Diego State University (CISDSU) participated in the Chinese New Year celebration concert at Copley Symphony Hall. The concert was performed by Zhejiang Symphony Orchestra and Chongqing Chuanju Theater. 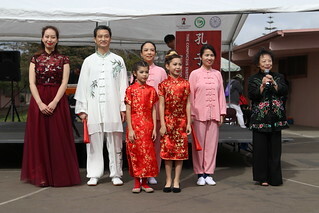 The event was hosted by Shillman Foundation and San Diego Yantai Friendship Society. CISDSU served as the in-kind sponsor for this event. 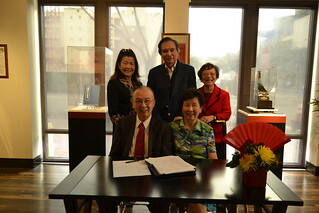 In the afternoon on February 22, Managing Director of the Confucius Institute at San Diego State University (CISDSU), Dr. Lilly Cheng, and CISDSU Project Coordinators attended an exhibition opening at the San Diego Chinese Historical museum. This exhibition features the life story of Dr. Shih-Liang Chien. Dr. Chien was the president of National Taiwan University. At the exhibit opening, Dr. Shih-Liang Chien's son, Dr. Shu Chien, presented the topic "Father's Influence on My Life." After the presentation, guests headed to the exhibition room to view and explore the family tree and rare artifacts of the Chien family collections. This exhibition is informative and inspirational for all guests and participants. In the morning of February 20, Miss Xiangjun Wang, a visually impaired student from Tianjun Conservatory of Music, visited Confucius Classroom E3 Civic High School. She brought to the students a spectacular piano concert. During the concert, Wang shared her music journey. With lots of love and help from the community, with her dedication and hard work, she never stops learning. She encouraged students to close their eyes and experience how visually impaired people play piano and write in Chinese. In the evening of February 18, the 12th Annual Heart-to-Heart Hand-in-Hand Charity Series was hosted with great success by American Chinese Culture and Education Foundation(ACCEF) and Xingjian Dance Studio at Poway Center for Performing Arts. 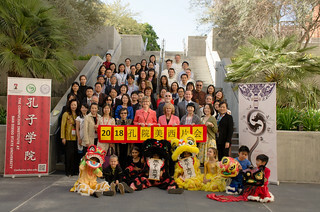 Confucius Institute at San Diego State University(CISDSU) was invited as honored guest to participate in this event. And CISDSU Six Arts instructor Ms. Dan Liu performed an Chinese National Orchestra Suite as one of the members of Bohua Academy. 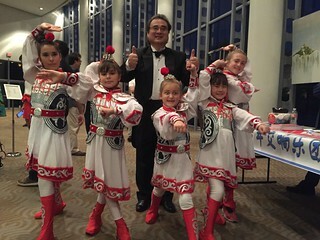 On February 18, CISDSU celebrated Chinese New Year with Six Arts Performances at SeaWorld. Confucius classroom students and Hanban teachers presented their talents in relation to the Confucius’ Six Arts – tea ceremony, lion dance, one stroke painting, abacus, YoYo, peacock dance, Taichi fan, and Chinese instruments. This year, we also brought to the audience a Mulan musical performed by the Barnard Students Performing Group. The Six Arts Performances were well-received by thousands of audience at SeaWorld. The festivity and the variety of programs brought to the audience a cultural and educational experience to celebrate the Chinese New Year. On February 17, a piano concert featuring visually impaired student from Tianjin Conservatory of Music, Miss Xiangjun Wang, took place at the Canyon Crest Academy. 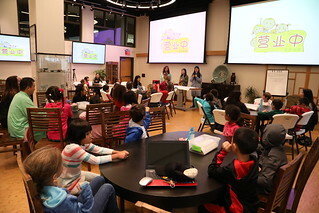 This program was hosted by San Diego Hua Xia Chinese School and the Confucius Institute at San Diego State University (CISDSU). Special guests presented at this concert included Mr. Salvatore Giametta, Representative from San Diego County Supervisor Ron Roberts Office, CISDSU Managing Director Dr. Lilly Cheng, David Du, Yingji Peng and media representatives from WeChinese and San Diego Chinese Press. To begin the concert, Wang made a speech about her journey learning music. Even with her impaired vision, she never gives up her dream. Then she beautifully and professionally performed piano music. No one can imagine how she can do that without being able to see the 88 keys on the piano. After each performance, the audience gave her a big round of applause. During the concert, CISDSU Six Arts instructors Professor Rensong Li and Dan Liu were invited to perform Taichi sword and Guzheng. With the western piano played by a Chinese musician, and traditional Guzheng instrument and Taichi, this was a concert of “East meets West”. After the concert, CISDSU Managing Director Dr. Lilly Cheng presented an appreciation certificate to Xiangjun Wang, and encouraged her to continue to chase her dream. 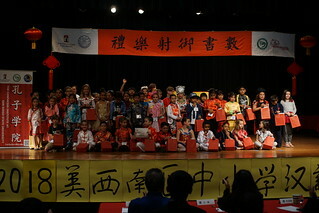 On February 16, Confucius Classroom Riverview International Academy celebrated Chinese New Year at the school auditorium. Confucius Institute at San Diego State University (CISDSU) participated in this celebration. CISDSU Managing Director Dr. Lilly Cheng and Principal Dr. Brian Thurman made an opening speech. Dr. Thurman appreciated the partnership with the Confucius Institute and the dedication of all the Hanban teachers to make their Mandarin Immersion program so successful. After the welcome speech, students from the K-5 Mandarin Immersion classrooms performed Chinese cultural performances such as Chinese songs, dance, Yo-Yo, Taichi etc. All the performances featured the Six Arts. 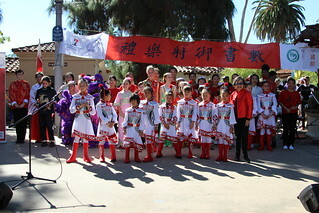 On February 15, also Chinese New Year Eve, Confucius Institute at San Diego State University (CISDSU) Co-Director Cunlu Zhang and Six Arts Instructors Rensong Li and Dan Liu drove two hours from San Diego, and finally arrived in Confucius Classroom Central Elementary School, which is located in Banning, California. Today was the day to celebrate the Chinese New Year with the students and teachers from the school. Before 9:00am outside of the auditorium, parents and families queued up to watch the performance. Students wore Chinese style outfits and felt excited to perform. The performances included singing, dancing and so on. The celebration was emceed by students in Chinese and English. The spectacular performances won rounds and rounds of applause from the audience. The teachers, on the other hand, had prepared a beautiful Chinese style dance to showcase their talents. 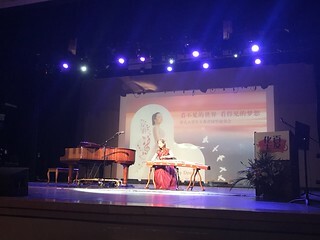 To end the show, CISDSU Six Arts Instructor Rensong Li performed Martial Arts and Guzheng teacher Dan Liu gracefully performed the Guzheng instrument. Through the Chinese New Year Celebration, Chinese Style has become a town-wide hit in Banning. Students, teachers and families all embraced the festive celebration. 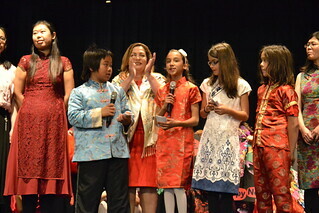 The annual Chinese New Year Cultural Week is a tradition of Pacific Beach Middle School. During Feb 12th to 15th, we had lots of exciting activities for the 2018 Spring Festival in our school. In order to expand the influence of Chinese year and let more students like Chinese traditional culture, we had series of outdoor and indoor activities. For the outdoor activities, we invited CI talented teachers Rensong Li and Dan Liu to give a fantastic Kungfu and Guzheng performance. These performances were greatly enjoyed by both the students and the teaching staff. Peking Opera mask and Taijifan show by the students and teacher Zhengzhi Chen were appreciated as well, drawing a great number of students to participate and learn. In the library, with the help of the Chinese teachers, Boyan Zhang, Wen Shi, Min Liu, Xiaofeng Liu and Zhengzhi Chen, the Mandarin students set up booths for students all over the school to experience Chinese Calligraphy, Chinese Painting, Chinese Zodiac, Ping Pang, shuttlecock, lantern-making, three-dimensional “spring” cutting, chopsticks competition and making dumplings, attracting lots of teachers and students to experience. At the same time, we were highly praised by teachers from other states in the United States who happened to come to our school for a conference. They were attracted by the amazing Chinese culture took photos for the wonderful moments. We gave them blessings in Chinese Calligraphy by our students as a gift and spread our blessing and Chinese culture to all parts of the United States. In the evening of February 15, which is Chinese New Year eve, SDSU Chinese Students and Scholars Association (CSSA) hosted a Spring Festival Gala at the Student Union. 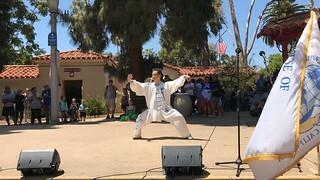 Confucius Institute at SDSU (CISDSU) Six Arts Instructor Professor Rensong Li was invited to perform Taichi Fan. Confucius Classroom student at Pacific Beach Middle School, Leah Markworth, performed Peking Opera. Their performances were warmly received by the audience. 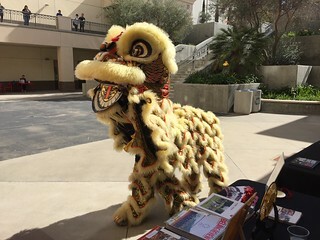 On February 13, San Diego State University (SDSU) hosted its Lunar New Year Lion Dance on campus. This event was a collaboration of Confucius Institute at SDSU, Center for Asian & Pacific Studies of College of Arts & Letters, Delta Beta Tao, and Asian Pacific Student Association. The Lion Dance ceremony left from the Student Union and continued in front of the Arts and Letters Building. Students, faculties and staff joined the lions to celebrate the Lunar New Year. On February 13, 2018, CISDSU was invited by La Jolla Country Day School, to celebrate Chinese New Year with the students. 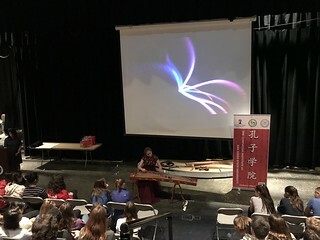 CISDSU Six Arts instructor Ms. Dan Liu performed a traditional Chinese instrument called Guzheng. Before the performance, Ms. Dan Liu gave a presentation about the history of Guzheng. Students were able to understand this ancient instrument with over 2,500 years of history. For most students, this was their first time to see the Guzheng. During the performance, the auditorium was filled with audience. Students were eager to learn the beauty of this Chinese instrument. At the end of the performance, La Jolla Country Day Vice Principal Inez Odom received a Chinese calligraphy from Ms. Liu Dan. Ms. Liu also wished the school a Happy Chinese New Year! 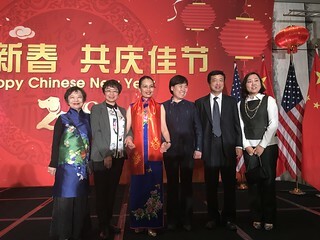 In the evening of February 12, 2018, the Chinese Consulate General in Los Angeles hosted a Chinese Lunar New Year Reception in the Hilton Hotel at Universal City. Confucius Institute at San Diego State University Managing Director Dr. Lilly Cheng, Co-Director Cunlu Zhang participated in this event. During the reception, Education Consul Haiying Chai and Qian Cao, Culture Consul Jin Wang wished CISDSU a Happy Chinese New Year, and discussed with the directors about future plans to develop culture and education programs in San Diego. 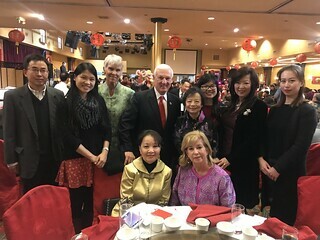 In the evening of February 10, Confucius Institute at San Diego State University (CISDSU) staff members and friends participated in the Year of the Dog Celebration Banquet hosted by House of China and Chinese School of San Diego. The banquet took place at Jasmine Seafood Restaurant. CISDSU Managing Director Dr. Lilly Cheng, Co-Director Cunlu Zhang, Project Manager Anne Chu, Project Coordinators Chudan Li, Muting Huang, Yueying Zhan, Six Arts Instructors Dan Liu and Rensong Li, Friends of CI members Caroline Chinn, Sharon Garuba and Anne Rosser attended the event. On February 10, 2018, the Confucius Institute at San Diego State University (CISDSU) celebrated Chinese New Year at Barnard’s community celebration event. Six Arts performance was featured, including Tibetan dance, Tibetan “Khata” greeting ceremony, Abacus, Mongolian song, Taichi Fan, Guzheng music and Chinese Yo yo. Performances were presented by Confucius classroom students and teachers. Audience was impressed by the performance. Principal of Barnard, Aida Hernandez was greeted with a special “Khata” from CISDSU Managing Director Dr. Lilly Cheng. “Khata” is a trdaditional Tibetan silk scarf representing the friendship between CISDSU and Barnard. On February 9th, 2018, “Happy Spring Festival” Exchange Program was hosted at Mission Bay High School, sponsored by Ministry of Culture of the People’s Republic of China and the Confucius Institute at San Diego State University (CISDSU). The performers are from the Art Troupe of the High School Affiliated to Remin University of China (RDFZ). Managing Director Dr. Lilly Cheng of the CISDSU, Vice Principal Xiaohui Liu of the RDFZ, President Michael McQuary of School Board of San Diego Unified School District, and Principal Ernest Remillard of Mission Bay High School were present at the performance. RDFZ Art Troupe showed the various programs that express the different characteristics of China. The programs included chamber music: Spring Festival Sinfonia, Butterfly Lovers and Csardas, folk music: Sentiment in Waterside and Jasmine Flower, dance: New Charm of Ancient and Qiao Huadan, martial arts: Shi Feng and Rivalry, and Curtain Call: Welcome to Beijing. Spectacular programs were enjoyed by every student from Mission Bay High School. This performance program aims to strengthen the friendship and cultural exchange between China and the U.S. In the morning, RDFZ Art Troupe observed classrooms in Mission Bay High School and interacted with the students. Through exchange and interaction, students from both countries enhanced friendship and cross-cultural understanding. On February 9, 2018, Confucius Classroom Barnard Asian Pacific Language Academy hosted a magnificent Chinese New Year celebration at the auditorium of Mission Bay High School. 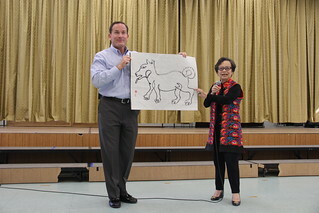 The students enthusiastically demonstrated the Chinese traditional art they learned from the Six Art Culture Program created by the Confucius Institute at San Diego State University (CISDSU). Principal of Barnard Asian Pacific Language Academy, Aida Hernandez, Managing Director of CISDSU, Lilly Cheng, and Project Manager, Anne Chu, and President of School Board of San Diego Unified School District, Dr. Michael McQuary were present at the performance to celebrate the Chinese New Year together with the students. At 9am, nearly 800 students and parents swarmed into the auditorium. Soon after four student masters of ceremonies opened the show in fluent Chinese. Students from all grades at Barnard Elementary School, including pre-school and kindergarten participated in the show. Led by Six Arts culture teachers, the lively and active children performed songs and dances such as Mulan, Happy Monsters are Patrolling the Mountain, Where is Spring, and Hug Me If You Love Me, and demonstrated the Six Arts skills they have mastered at the program such as Chinese calligraphy, Kong Fu, and Tang poems. Their marvelous performance won thunderous applause from the audience, a strong affirmation to the Six Arts Culture Program by the CISDSU. On February 8th, 2018, Adobe Bluffs elementary school held its annual Chinese New Year Community Celebration. 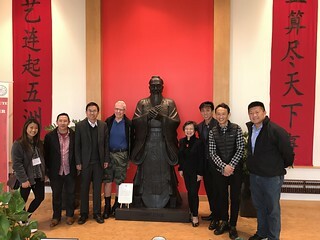 Managing Director of Confucius Institute at San Diego State University (CISDSU), Dr. Lilly Cheng, Co-Director, Prof. Cunlu Zhang, and martial arts master, Prof. Rensong Li participated in this event. Students, teachers, parents and school district officers get together at auditorium to celebrate the Lunar New Year. Students from kindergarten to 5th grade performed a variety of performances and showcased their Mandarin learning achievements. There were two highlights of the performance. One is martial arts master, Prof. Li’s sword dance and the other one is teachers fashion show. Teachers wore different kinds of Chinese outfits to show how beautiful and elegant of these Chinese outfits are. This event was not only for students but for local community to appreciate and explore ancient Chinese culture. CI/SDSU is dedicated to promote Chinese culture awareness and acceptance in culture diversity by bringing forth authentic Chinese culture experience to local communities. 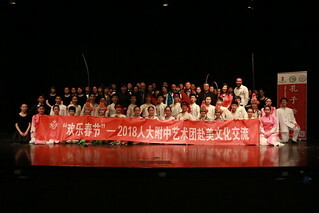 On February 8th, 2018, organized by the Consulate of People’s Republic of China in Los Angeles and the Confucius Institute at San Diego State University (CISDSU), the Art Troupe of the High School Affiliated to Renmin University of China, also known as RDFZ, gave a wonderful performance of Chinese traditional music, dance, and martial arts at El Capitan High School during their US tour to celebrate the coming Chinese New Year with the students and the teachers of El Capitan High School. 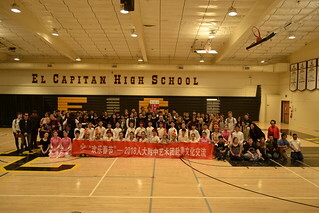 At 10am, almost 600 enthused students and teachers gathered in the gymnasium of El Capitan High School, including over 100 students of the Chinese language at the high school's Confucius classroom. Culture Consul Jin Wang of the Chinese Consulate in LA, Managing Director Dr. Lilly Cheng of the CISDSU, Vice Principal Xiaohui Liu of the RDFZ, Principal Laura Whitaker of El Capitan High School, and the Chinese instructing program coordinator Chi Ping Chang were also present at the performance. The performance began with the RDFZ chamber orchestra’s joyous rendition of the Spring Festival Sinfonia, a famous music piece composed specifically for the Chinese New Year. Its vibrant rhythm gave the room a festive vibe and greatly aroused the audience’s interests. The RDFZ boy’s dance troupe and the dance troupe of RDFZ Cuiwei Campus again impressed the audience by immersing them in the dazzling Chinese Tibetan and Han dance. The martial art shows Lion Dance and Rivalry, as well as Chinese and American folk songs by the RDFZ Chinese folk orchestra, all received overwhelming applause from the audience because of the outstanding techniques executed in the show. At the finale Beijing Welcome You, all the students stood up and applauded passionately for having seen such a great show. The RDFZ Art Troupe’s spectacular performance was cheered unanimously by the audience. Sydney Hood, an 11th grader at El Capitan High School with 5 years experience in Chinese language studying, told us excitedly after the show that “the show was amazing!” She mentioned that her favorite part was the dances, because she “learned a lot about the beauty of Chinese dance from the performance.” Jin Wang, the Culture Consul at the Chinese consulate in Los Angeles, also said that the RDFZ Art Troupe came to perform in the US in order to further develop cultural exchange between China and the United States. By inviting them to perform at El Capitan High School, where Confucius classroom is held, will create a better understanding of the charm of Chinese culture for the American students and also enhance the mutual communication between the students from the two countries. The RDFZ Art Troupe on this tour consists of over 80 students from RDFZ chamber orchestra, aerobics team, boy’s dance troupe, martial art team, and dance team and Chinese folk orchestra of RDFZ Cuiwei Campus. All performers are current students at RDFZ between 12 and 17 years old with excellent academic records and artistic accomplishments. The 2018 tour is the 12th time that the RDFZ Art Troupe performed in the US. On February 6, 2018, CISDSU participated in the Study Abroad Fair at SDSU. Project Coordinator Ms. Chudan Li and Six Arts Instructor Ms. Dan Liu attended the event. On Saturday February 3rd, 2018, the Confucius Institute at San Diego State University (CISDSU) celebrated Chinese New Year with House of China at Balboa Park. 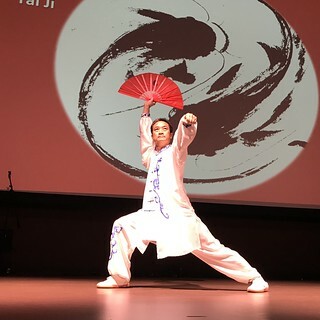 This year, CISDSU brought to the audience “Six Arts” performances which include tea ceremony, musical instruments, calligraphy, painting, Taichi fan, abacus, dance and a special Mulan musical. Over 1000 audience watched the performance on that day. The emcees of the performance were Confucius Classroom students from Pacific Beach Middle School, Leah Markworth and Christopher Santy. They wished the audience a happy new year with their fluent Mandarin skills. Barnard Asian Pacific Language Academy student performing group prepared a musical Mulan, adopted from the story of Hua Mu Lan from ancient China. Chinese Bridge champion Kassia Love performed an instrument called Hulusi, with Harmony Richardson from Tierra del Sol Middle Students performed a Peacock dance, a traditional type of dance from Southwest China. Confucius Institute teachers showcased their talents with a Taichi Fan performance. Chinese minority song and dances were also performed by Barnard students. Last but not least, Chinese one-stroke brush painting and abacus performances also brought to the audience an educational and cultural experience. 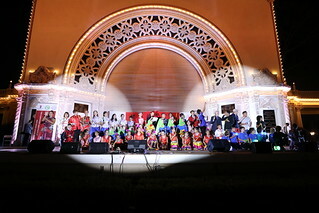 The theme of the celebration focused on “Six Arts”. At the grand finale, all performers sang the Chinese New Year song “Gong xi gong xi”. The song’s festive melody won rounds of applause from the audience. In the morning of January 30, the Confucius Institute at San Diego State University (CISDSU) was featured by San Diego local news station – NEWS 8. CISDSU Six Arts Instructor, Professor Rensong Li, demonstrated Taichi fan and Taichi sword on the Morning Extra program. House of China president, David Seid, and House of China Director Lily Zhou also gave the audience a preview of this weekend’s Chinese New Year celebrations at Balboa Park. During the show, TV Host Jeff Zevely interviewed Professor Li about Taichi. CISDSU will proudly present Six Arts performances on Saturday, February 3 at House of China, Balboa Park. Performances will include tea ceremony, Chinese instruments, Taichi, Chinese painting, minority dances, abacus etc. They )will be performed by our talented Confucius Classroom students and teachers. Come watch the show at noon on Saturday to kick start the New Year! 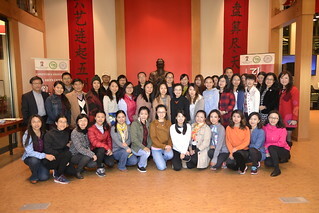 On January 20, 2018, the Confucius Institute at San Diego State University (CISDSU) hosted the January Teachers’ Training Workshop at Six Arts Center. In the morning, Dr. Lilly Cheng, Managing Director of CISDSU, presented her topic “Octopus Project”. According to Dr. Cheng, “Creating your vision for 2018” is important because “Your answers not only reflect your value and vision, but will also motivate you to strive to achieve your goals in the new year”. Afterwards, Hanban teachers Ms. Xin Guan and Ms. Xiaofeng Liu shared their experiences on teaching in Confucius Classroom schools. Furthermore, over 20 Hanban teachers also reflected on their teaching experiences and what they’ve learned from previous training workshops. The afternoon workshop focused on English writing. Guest speaker, Dr. Leif Fearn, spoke on “English Writing Know How”. His presentation aims to strengthen our teachers’ English writing skills. © 2009-2018 The Confucius Institite at San Diego State University. The statements found on this page/site are for informational purposes only. While every effort is made to ensure that this information is up-to-date and accurate, official information can be found in the university publications.